Lomography Cameras: Does 1/100th of a second really mean 1/100th of a second? tl; dr: Using a phototransistor, an infrared LED, and an oscilloscope, I measured the shutter speed of a mechanical film camera made by Lomography. 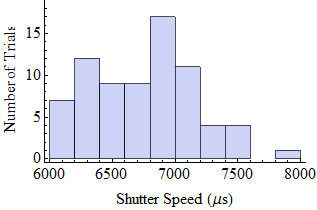 The shutter speed was spec'd to be 1/100, but after measuring 75 shots, the average (plus or minus one standard deviation) was between 1/140 and 1/160, or about half a stop darker than the spec. These cameras are not meant to be precise, of course; the experiment was purely for curiosity's sake. I hadn't shot a roll of film since 1998 until two days ago, when my wife Liesl bought me a spiffy new Fisheye Camera #Two from Lomography for my birthday. It's a charming retro film camera and takes funky snapshots that have character you don't typically get from digital photography. I just love its simplicity: an entirely mechanical camera that has fixed focal length, fixed focus, fixed aperture, and fixed shutter speed. Spring-loaded mechanical shutter, manually wound film, no light meter -- no batteries required! We bought a roll of 400 film at Walgreens, and giddily started snapping away. I had no idea what the shutter speed or aperture were so didn't know what kind of exposures to expect. 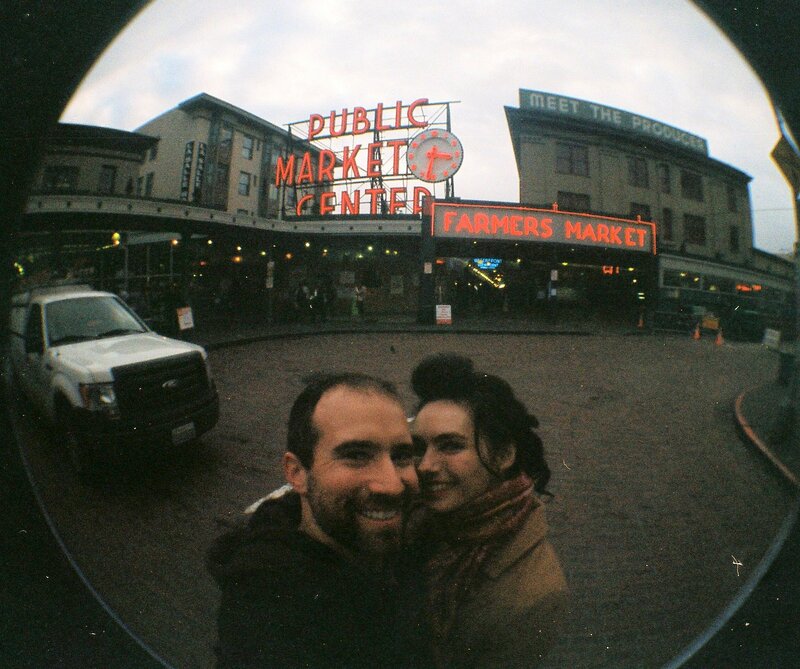 Our first roll had a couple of gems, such as the photo on the right of us at Seattle's Pike Place Market. Most of our indoor shots were too dark to be usable, but some came out fine. This got me to thinking: is there some way I could measure the shutter speed? Also, could I measure the speed variance, to determine if the mixed results I saw were my fault or just a property of the camera? An infrared phototransistor -- a device that conducts electricity when infrared light hits it. Think of it as a switch that is activated by light. An infrared LED. I normally don't keep these around, but Liesl had gotten me another cool gift last month: Herbie the Mousebot, a clever little light-following robot made by Solarbotics. It comes with an IR LED that I hadn't used. An oscilloscope. If you're looking for one that's both capable and cheap, I recommend the Rigol DS1000E series. So my plan was hatched: I'd mount the phototransistor behind the shutter, shine the LED into the camera's lens, and use the oscilloscope and the simple circuit shown at the right to measure the shutter speed. Of course, halfway into building the test rig, Liesl discovered that Lomography has a page full of the camera's specifications, which says the shutter speed is 1/100. As my friend always reminds me, "A month in the laboratory saves you an hour in the library!" I decided to do the experiment anyway, in the interest of (a) scientific curiosity, and (b) fun. I set the scope to trigger on a high-to-low transition and pushed the shutter button. To my dismay, nothing happened. As it turns out, the test setup was extremely sensitive to the position of the phototransistor; fractions of an inch mattered. Luckily, the Fisheye Two also has a Bulb feature, so I was able to hold the shutter open with one hand and adjust the sensor position with the other, watching the output on the scope. Once everything was reliably positioned, I put the camera back into its normal shutter mode. Finally, the moment of truth arrived: I pushed the shutter release and was rewarded with the perfect waveform on the right! 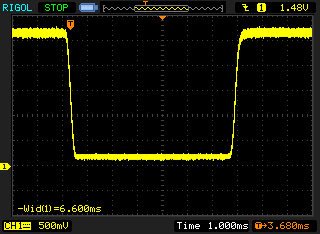 I turned on one of the Rigol scope's handy measurement features and it told me the width of the negative impulse was 6.60 milliseconds, or about 1/150th of a second. Doing this test once is fun, but it's not science. And I like science. So I did the same test 75 times and recorded all the results. A histogram of the results is shown on the right (raw data here). The mean is 6728 μsec (1/148th of a second) and the standard deviation is 417 μsec. If the shutter speeds are normally distributed (i.e., follow a "bell-shaped curve"), that means 68% of the exposures will fall between 1/140 and 1/160, and 95% will fall between 1/130 and 1/170. 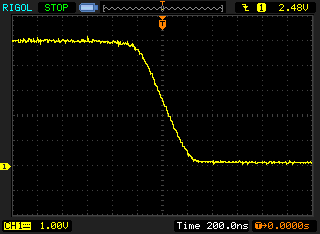 Overall, it's about half a stop faster (darker) than the 1/100th of a second in the specs, with a variance of about one-fifth of a stop. An open question is the variance from one camera to another. The feeling I get from reading through the Lomography discussion forums is that each camera is unique; people sometimes try a bunch of them to get one that takes pictures they like. Maybe shutter speed variance is part of that uniqueness. I'd be interested in finding another couple of Fisheye Two cameras and putting them through the same test. But overall, I found the answers I was looking for: (1) my camera's shutter speed is 1/150, half-a-stop darker than expected; (2) the variance is just one-fifth of a stop, probably not enough to matter; (3) the bad photos were my fault. I probably could have guessed (3), but I guess it's always nice to have science behind one's poor self-assessment. Jeremy Elson is a computer science researcher at Microsoft Research, who spends his time outside of work riding bicycles, flying airplanes, building electronics, and taking photos.